Jane, this post is just perfect, I've been looking to make an iPad case and had started searching for patterns. The Funky Apples would be great for an iPad case, but I do love the Dinosaur Volcanoes in blue. Thanks for a great tutorial and giveaway. There are so many lovely bundles to choose from but I really like the Nautical fat quarters. Perfect for the summer. Thanks for this brilliant little tutorial - I definitely fancy making one of these little cases! I love the 'Pink orange deer woodland scandi' bundle! Thank you for the Tutorial Jane. Thank you also for the chance to win the fabric - if I were the lucky winner I would definitely choose the Michael Miller "Helen's Garden". Id have to go for the Pink Owls, would make a fab phone holder, laptop holder, notebook holder, anything else holder! Thanks for the giveaway and tutorial. i also lve the blue dinosaurs my youngest daughter would love taht as she's dino mad! This is a very cute phone holder I may have to give it a try. Woodland Kitzbuhl would be my first choice of bundle but there are several there that I could choose. Thank you for introducing me to their site I am new to sewing and trying to find good places to get supplies and they seem to fit the bill very nicely. This is a great tutorial for a really useful little holder. I need to get some interfacing as I've never worked with it before and make this very soon. If I was lucky enough to win I'd love petit street. I've been needing a phone case; this looks super easy. Thank you! My favorite fat quarters are the Pink Orange Deer Woodland Scandi pack. I would love either Blue floral spot and birds. They are deliciously adorable! I need to make quite a few little bags for the whole family ! Thanks for the tutorial and the fab giveaway! I would love the 'Perfect for Spring' bundle, so so pretty. I would love the mathilda bundle! I'd choose All That is Spring b/c I'm so sick of winter! Ooh, lovely. I would pick the Petit Street bundle if I win. Thank you for the tutorial. I was just thinking I'd like to make something like this. I'd choose the retro 30's pink and blue bundle, it's really pretty. Thank you for the chance to win. Thanx for the fab giveaway. I would love to win the wee wonder blue bundle. Lovely tutorial! I really like the 'my sunshine' bundle. Cute idea Jane! I would definitely try my hand at this tutorial with the Snips Green bundle! A great tutorial and a generous giveaway. I love the "Sweet Christmas" and the "Petit Street" bundles. If I were lucky enough to win, I'd leave the final choice to Stephanie as fabric surprises are always good. Very nice! Simple but effective, and smart. I would have to go for the 'Space' FQ bundle. It glows in the dark! Ooh, lovely tutorial! I'd love the Blue Floral Spot bundle if I won. Also, where do you get your labels made? I've always loved them on all your makes. Thank you for such a great tutorial! It is now bookmarked ready to try soon. I love the Sweet Christmas bundle. I'd choose Nautical 5. It would make a great patchwork tote - with a matching phone case obviously! I love your tutorial Jane! Such a satisfying quick make. Boy will start school soon so I'm stock piling ideas for school fetes and fundraisers! There's almost too much choice at elephant in my Handbag! I love the Dino bundles and also the wee wander. Your case tutorial is perfect! I'm pinning for our stash busting! Great giveaway! I would choose the Robotic bundle. Thank you for the fun tutorial and the giveaway! I like the "Yay Day" Organic Cotton Fat Quarter Bundle by Birch Organics. So many fantastic choices! I think my favorite is "Nautical" 5 Funky Sailing Beach Fabrics Fat Quarter Bundle. This is a really handy little tutorial! Would be great to make these pouches for all sorts of things as well. I would love the "Woodland" Organic Cotton Fabric Bundle by Monaluna, that fabric is beautiful. I'm torn between "handmade" and "robotic". I think the first would get used quickest though. Thanks for the giveaway! I love the Blue Pink Floral Retro. So many adorable fabrics! Well I'd love the 30's florals, my daughter would kill for the fairies, but I'm going to choose Woodland so both my boy and girl children can benefit!! I would like the blue woodland kitzbuhl. I'm very new here but thank you for the solution to my much-needed new iPad cover! And it would look f-a-b-u-l-o-u-s in those nautical fabrics. 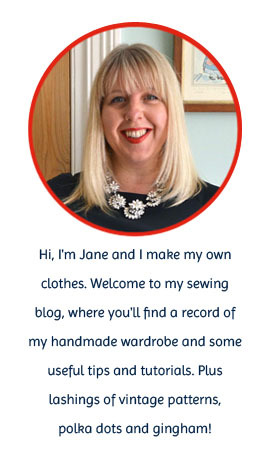 Great tutorial Jane, thanks so much! I might add a pretty button over the velcro square on the outside just for decorative purposes. I would choose the small chevrons bundle by Riley Blake, I love chevrons, they go with everything and this bundle comes in such lovely colours so there would be plenty to choose from! I would love the Wee Wander floral blue bundle - am making a lampshade in the same fabric (I think it will look lovely with the light glowing through the fabric), and some matching accessories would be lovely! I could make a lovely kindle cover from the bundle - and an extra couple to give away as presents! Oh Jane, I had to grab a coffee so that I could give the Tutorial my whole attention. I shall make one for my Kindle first, much nicer that the Amazon one, but I may add a touch of wadding or even the thick plastic to help protect it when I, Inevitably, drop it. Just had a peek at the fabrics, how can I choose from such a delicious selections? Like a previous commenter ( making some for her School Fete/Bazaar) I shall make some of these for the Marie Curie Charity that I support. Thank you so much for the good idea. I have just stuck a mental pin in and chosen "Summer Fair" Grey Blue Pink Fabric Bundle by Tilda. It's great idea and phone holder is so cute! LOVE the little phone holder - especially as I have the same phone! Would adore to win All That is Spring FQ. Nice! I just love the Wee Wonder Blue! Wow, thanks for the giveaway! There are so many lovely bundles, it's pretty hard to pick one. I guess I'll go for the Woodland Kitzbuhl by Westfalenstoffe :). Thank you for the tutorial. It looks so fantastic with very clear directions. I tried another tutorial before and it was a flop. My FQ choice would be "All that is Spring" Grey Blue Pink Fabric Bundle by Tilda. Fab frocks and phone holder! If I were lucky enough to win the fabric bundle I'd choose the gorgeous "Handmade" because it sums up everything you and me are about, and all that is right with the world! Such a cute project! I'd have to choose the Woodland Kitzbuhl bundle, such cute prints! Nice phone cover. I'd probably choose the "Petit Street" 4 Fat Quarter Bundle by Dashwood Studio. Very cute. Really like the clouds print. I absolutely love the "Pink Orange Deer Woodland Scandi" - would be so cute for a cover. I fell in the love with the "Woodland Kitzbuhl"! Lovely little tutorial! I have been meaning to make a phone holder since a bit... although I might replace the Velcro with a popper or a button and loop in order to avoid little things getting stuck in the closure. I love the bright and happy colours of the "My Sunshine" - Pink Birdspot Bundle! I've made several of these now following this tutorial and I love them. Thank you !